What is the Best Detergent? None! For years, people have used washing machines to do their laundry, and their biggest questions have been “what is the best detergent,” and “which machine is best.” Detergent companies advertise heavily, and continually strive for higher efficiency products, with broader appeal. However, the surprising truth is that the best detergent may be no detergent at all. Detergent can cause allergies because of the chemicals used. A test called “Human Repeat Insult Patch Test” is used to evaluate a person’s sensitivity to detergents because of the wide variety of chemicals used in detergents, brighteners, bleaches, softeners, and fragrances. Reactions can be reduced by using hypoallergenic detergents, and by keeping the washing machine in good repair, to reduce leftover residue. Detergents are wearing on clothes. The chemicals in detergents can cause fading, and even pilling, because they are abrasive in nature. Detergents cause pollution. 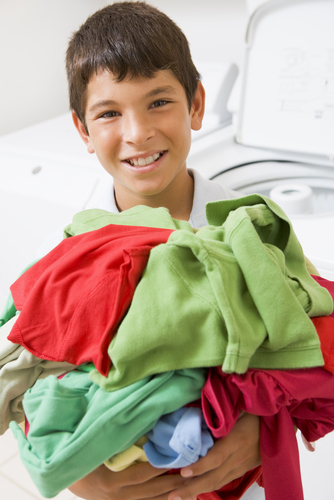 According to the EPA, chemicals used in detergent could enter the water supply through runoff. These toxins may have a harmful effect on wildlife, as well as affecting the public water supply. Detergents are expensive. According to EnergyStar.gov, the average American household spends as much as thirty dollars each month on detergent, and even more on fabric softeners, bleaches, and other cleaning agents. Fortunately, detergents can be avoided altogether. Having been used for several years in hospitals, energy efficient washing machine models that eliminate detergents are now available for household use. By using these, customers do not just save water but also keep irritating soaps and bleach out of their washing water. The two-pronged approach of water and energy efficiency is a great way to be kind to the environment and save on your water and energy bills. It is an exciting time for green technology, and Vollara offers innovative products to help you live a cleaner, healthier life. With a commitment to promoting good health through eco-friendly technologies, Vollara lives up to a philosophy of Uncompromising Health. Visit our website to learn more about our eco-friendly products, or join our online community on Facebook, Twitter or Pinterest. Green Technology Trends, What is the Best Detergent? Water 101: Help Save One Billion Gallons!